Getting a learner driver permit, Nessan School of Motoring, Munster's Leading Driving School, Private and Commercial Driving Lessons, Learn to drive in Limerick, Cork, Kerry, Clare, Tipperary, Waterford. We have a large fleet of vehicles including; Cars, Artic & Rigid Trucks, MiniBus and Coach. 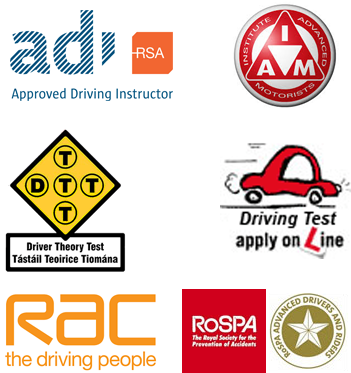 Our vehicles are available for tuition and driving tests throughout the Munster region. A guide to the procedure to obtain a Car Learner Driver Permit which is needed before driving lessons begin. Nessan School of Motoring have Gift Vouchers available for any occasion. Before you begin lessons you must first have a Learner Permit, below are separate explanations of the processes to gain; Car, Truck and Bus Learner Driver Permits. This is the procedure to obtain a Car Learner Permit. 1. Make application to the Road Safety Authority's Driver Theory Test website to sit theory test for category B. (Apply online here). 4. On receiving your learner permit, you are now ready to book driving lessons. Contact us to book driving lessons. The CPC is a standardised EU acredditation for professional bus drivers and 2009 for professional truck drivers. Once qualified to keep your Driver CPC, you must do 35 hours of periodic training over the next five years. CPC Step 1 - Is a Truck and Bus theory test enabling successful candidates to apply for their learner permit. CPC Step 2 - Is a two-hour case study theory test. CPC Step 3 - The standard 90-minute driving test. CPC Step 4 - 30-minute practical test. The Procedure to obtain a Truck Learner Permit (CPC1). 1. Make application to the Road Safety Authority's Driver Theory Test website to sit theory test for category C. (Apply online here). 3. On successfully passing your theory test, take your theory test certificate to your local NDLS office with the following. 5. Contact us to book driving lessons. 6. Make an application to do the theory test CPC 2 – Case studies (Apply online here) or Lo-call: 1890 60 61 06. 7. Make an application to do your driving test CPC 3 and your practical CPC 4. These two tests normally take place in the one day. (Apply online here) or Lo-call: 1890 50 60 80. The procedure to obtain a Bus Learner Permit (CPC1). 1. Make application to the Road Safety Authority's Driver Theory Test website to sit theory test for category D. (Apply online here). Driving Lessons in Limerick, Cork, Kerry, Clare, Tipperary, Waterford. Learn to drive with Nessan School of Motoring, your key to safe motoring.